and all of the housework was finished on Friday night. spends the day outside on pond duty. keeping him company by having one yourself. Just so we're clear on that. With a whole day on our hands, we decided to go on a road trip. I pretty much agree to any suggestion of a road trip because first, the Artist always drives and after commuting all week, I'm ready to hand over the reins. And secondly, as surely you must know, I can take pictures.We're all the same, aren't we? So join us as we take our first Rural Roams day trip. I hope to make this a regular feature; we all have a bit of history, grandeur and legend right in our own backyards, and by sharing with you, what's in my neck of the woods, perhaps it will inspire you to do the same. Some future roams include the homestead of Adelaide Hunter-Hoodless, founder of the Women's Institute and The Bell Homestead, home to Alexander Graham Bell. To all of you who dared to guess, you were all correct. Niagara Falls was our destination. Your prize, should you ever decide to visit the real Rural Revival, live and in person...is a trip to Niagara Falls, with me. For a couple of reasons, I thought it a brilliant idea when the Artist suggested we take a drive to the Falls. 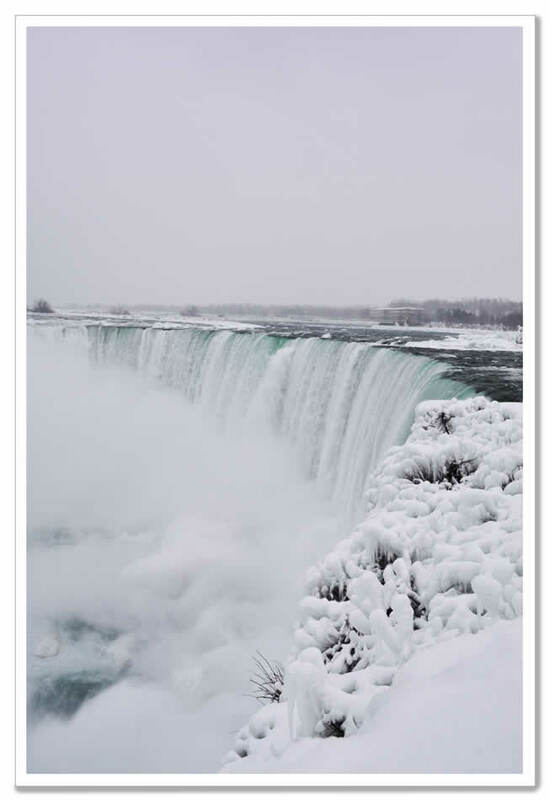 While I've been there more times than I count, I haven't visited very often in winter, and the twins, of course, need to visit this natural wonder of the world more often. They weren't really hyped up on the idea of going, but they didn't know how different the experience could be on the coldest weekend of the year. For one, it's cold. Very cold. There were foot long icicles attached to every building. But that's okay, because it's also very quiet, except for the actual roar of the falls. You can stand at the railing and gaze out at the water without being accidentally jostled by the person next to you, or asked to take someones family portrait, or get captured for life in someone else's family portrait as you inadvertently walk in front of them. Trust me when I say, this lack of crowd is the number one reason to visit in January. Even when it's really cold. But wait, there's more. Imagine you and thousands of other people all wanting to get a closer look as the water tumbles down with a swiftness that makes all those waterfall nightmares come back to memory and then realizing there are only three scopes. For all of you. How wonderful then to have your pick of any scope you want, and being able to use it for free because it's frozen open. This my friends, only happens when it's really cold. Just remember to dress warmly, long underwear is essential, bring gloves for photo taking and mitts to warm your fingers up and always wear a toque. Yes, we call them toques. You can call it a hockey hat, but there's the possibility you might get a funny look, eh? Maybe it's best if you wait til you're on the other side of the bridge and then call it a hockey hat or whatever you call it. What do you call it? By the way, I'll just mention this is the first time I've been near the border since I started blogging. Twelve hours from this spot to Tennessee. It was odd to be so close, yet still so far away. I waved, I did! Heading east away from the Falls, a lovely drive awaits you along the Niagara Parkway with many beautiful old homes, beautiful woodland and a plethora of farm gate sales. 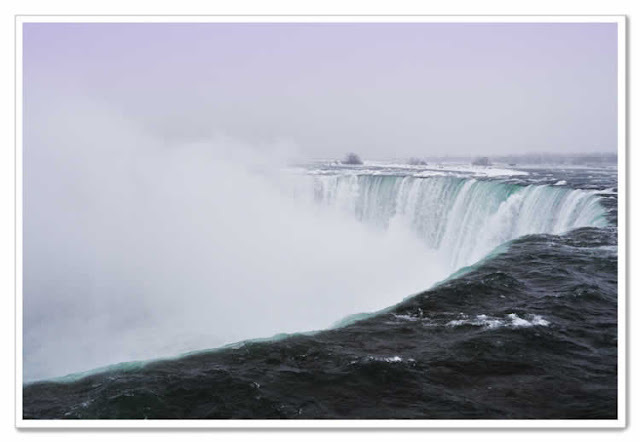 It also leads you to the tourist mecca Niagara on the Lake. It was beautiful, it still is in some ways but it's more of a Disneyland beautiful. It's nice to see but leave your credit cards at home. There are more wineries than you can shake a stick at however, and they offer tours and tastings. Don't come all this way and miss this drive. In fact, bring a driver! And if you really would like to get a feel for the area, the way it was at the turn of the last century. 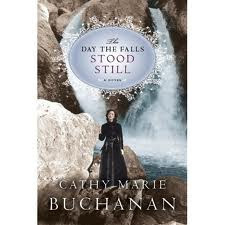 I highly recommend you read 'The Day the Falls Stood Still' by Cathy Marie Buchanan. 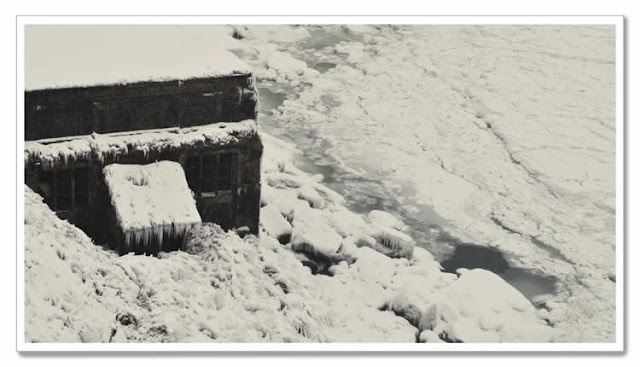 The story of a young girl coming of age in a city on the cusp of its own change, the hydroelectric age. 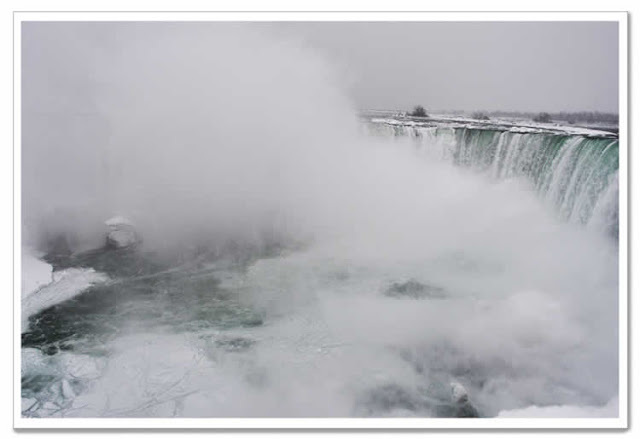 It's a wonderful narrative of life in Niagara Falls as it was before the Falls were diminished by harnessing it's power for electricity and the controversy that surrounded it. I hope you've enjoyed this little Rural Roam. I really do, 'cause then I didn't freeze my patootie off for nothing. VERY enjoyable! But talk about "lake effect" icing!!! Yikes!!! I'm cold now. Must go to bed under blanket, comforter and heavy afghan. BRRR!! Can't wait to see more "Roams"! I love it! I've never been there. I've never been. It's absolutely beautiful. Thank you for sharing. Okay ... what's up with men and pond duty? Just so you know ... it goes on here, in my Suburban neighbourhood, where nobody has a pond! I've thoroughly enjoyed your first Rural Roam! It's a great way to enjoy a day and discover new and exciting places. I am totally into weekend roadtrips. 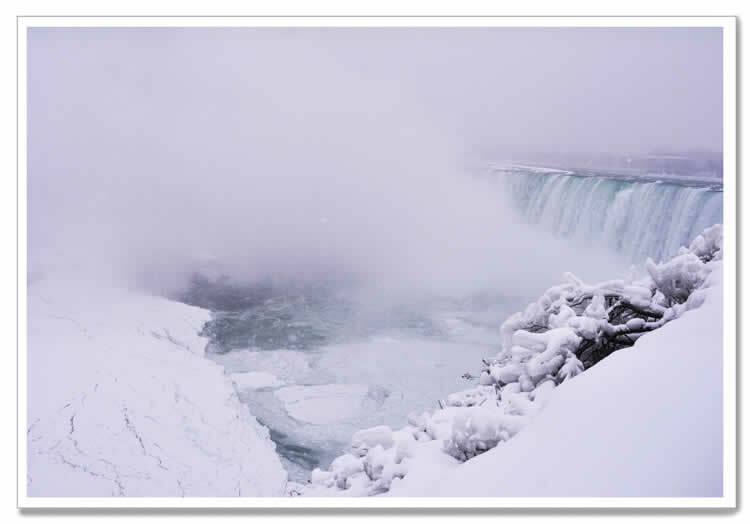 Niagara Falls is such a great destinatation but yes, it can become a tad bit crowded during the warmer months. 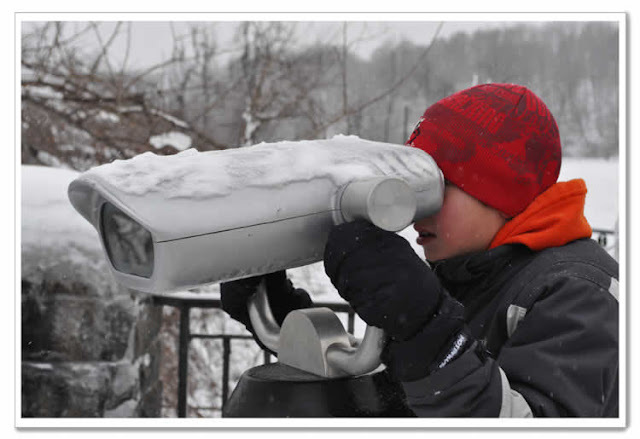 There is much to see in the surrounding areas as well so it's a great idea to go during the 'off' season. 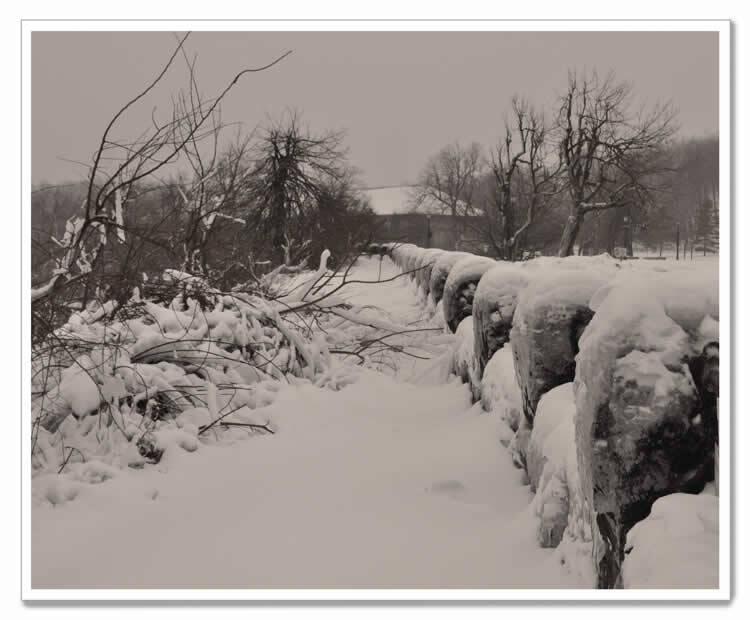 Your photos have really captured its beauty in the winter! Andrea...great post and great pictures! I even called my hubby over to look and said "I want to go there"! I have never been that far east and north...I try not to do many things during the tourist seasons...just too many people. I love your blog! It's so refreshing and witty! Your description of a summer visit to the falls is right on the money. Thanks for sharing! What a beautiful place to take pictures. I've never been to the falls and I was born and raised in Manitoba...of course Ontario is a HUGE province so it's not exactly a 'hop skip and a jump' from my old house to there. Love your photo's and your description of Pond Duty LOL! My hubby (American) called his toque a 'knitted hat' but after a few years he switched...he calls it his 'Jacques Le Blu toque' now. Hope you have a warmer day today. I've never been to Niagara Falls, so I really enjoyed your pictures. How gorgeous everything looks with all the snow and ice. Thanks for taking us along! My parents spent their honeymoon there in 1951. My mother always describes it as breath-taking. Thank you for sharing these awesome photos. Great to see the area in winter. This place is certainly on my bucket list :). Beautiful pictures! Looking forward to this series of roams! Beautiful photos! I've only been in the summer and like you said, it's always so crowded so it's nice to see it like this. What a great post! I've been wanting to go there for years - I've heard the Canadian side is better.....true? I'm so proud of you for freezing your patootie off for us! Great photos. I hate crowds so I may have to visit when it's freezing too! What fabulous pictures. I've only been there in the summer and it is so very different. I think I like it better cloaked in winter. Thanks as well for the book recommendation. Sounds like a great read. Looking forward to more of your rambles although your posts from home are always fantastic. I spent every summer as a child taking a trip to Niagara Falls! My grandparents always went and took me along! My parents also spent their honeymoon there and are taking a trip to Niagara Falls in the spring to celebrate their *big* anniversray!! Hmmm. I wonder. We were ever there at the same time! Little Andrea and Little Misha~getting in the way of each other's family pics! Never heard of a Toque! We have always called them *ski* hats. 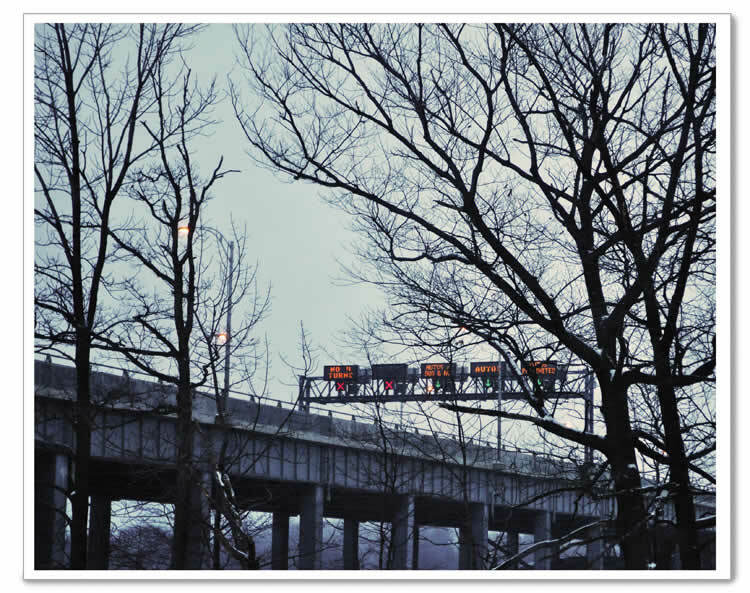 Then we moved here to Tn and everyone calls them toboggans! What?? I only know a toboggan as something I sit on to slide down the hill in snowy, frosty weather! You learn something new every day. Eh! We call them beanies around here. Beautiful pictures. I had to shiver while looking at them. 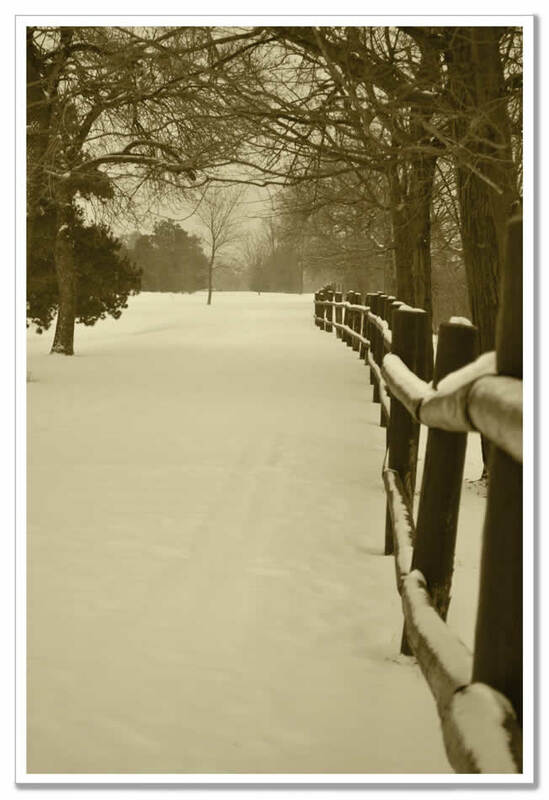 The photo in sepia is so beautiful. I would have that framed and up in my house. PS 12 hours isn't so far! I bet Annie saw you wave! We call them toboggans here. I’ve never thought of it being anything else-how fun. I love this. I have never been to Niagra Falls and I so want to go. I would love to go in January--I hate crowds anywhere and these pictures are beautiful. BEAUTIFUL! Is such a beatiful place, I didn't realize is so gorgeous in the winter! And I love the fact that you read, I can't imagine life without reading. I'm soooooo ready for a road trip and truly appreciate you sharing yours! That's one place on my list to vist. Then I'll look you up too! 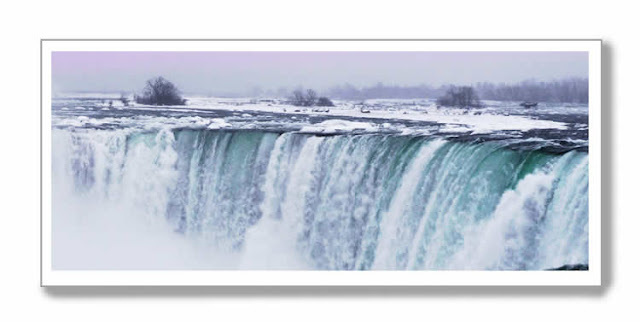 Andrea, I grew up in Buffalo and used to go to the falls ALL THE TIME! I loved your photos and was really excited to see that you were close enough to visit the falls. How cool was that? 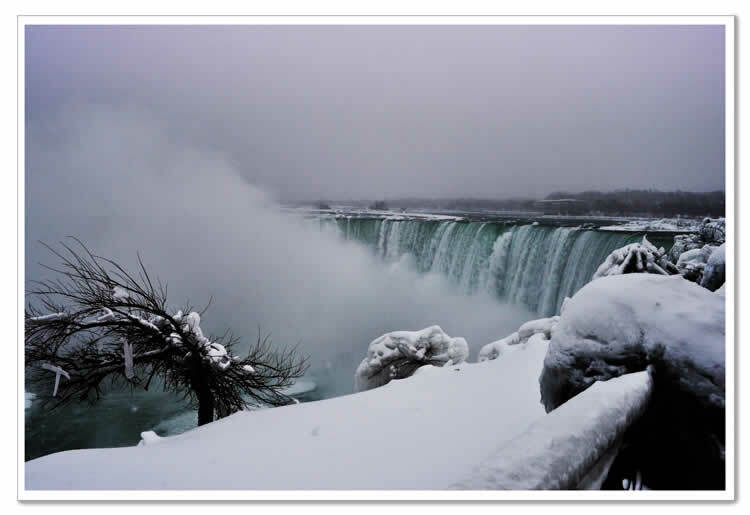 We did a road trip 71/2 years ago so we visited the falls in the summer....the winter is beautiful! Beautiful photos!! What beautiful photos! I've never been there. Wish I lived closer. I can't imagine the majesty of being that close to something so big! Thanks for giving me a looksie! You're right. We loved your photos. I've been told it's pretty cold up there in the winter. I can't imagine. The scopes brought back memories. I took a picture through the scope and got a good shot of the folks on the other side loading up on the boat..all dressed in yellow rain coats! The falls were beautiful! That's funny you mentioned forever being in tourists photos...I've got tons of photos with folks I don't know who wouldn't move or walked in to the picture! Thank you for mentioning this post to me. We appreciate seeing it all again!